The Quarters at Lake George is a luxury vacation resort with pristine townhouses overlooking the beautiful shores of Lake George. The Quarters contacted Mannix Marketing with the goals of getting a modern, attention-grabbing new design, making the website mobile-friendly, and showing travelers what makes this resort a dream destination. 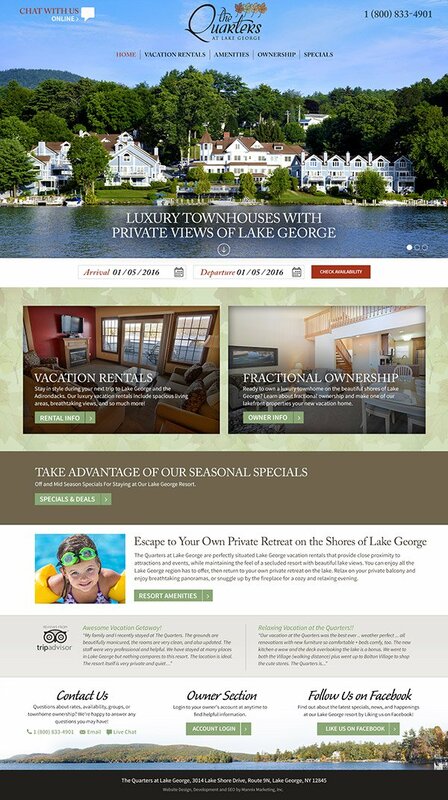 The home page features a stunning photo of the lakefront vacation rentals along with a compelling headline to visually and verbally convey what makes The Quarters at Lake George a dream destination. Photo-optimized sections of the home page helps The Quarters speak to their two target markets- travelers who are searching for lakefront vacation rentals, and those who are interested in fractional ownership. The Quarters at Lake George also offers an array of seasonal lodging packages and deals. Knowing that specials and deals can be a major appeal for prospective guests, we incorporated a section for Specials directly into the home page. Today’s travelers are hopping from one lodging website to the next and relying on room photos and virtual tours to “visually vet” each resort’s accommodations. To help travelers see what makes The Quarters’ accommodations so unique, we designed custom landing pages that display all of the important unit details in a visually appealing manner. Photo galleries, unit descriptions, a listing of amenities and more give visitors an inside look at these luxurious townhouse units. An online booking engine form and strategic calls-to-action are seamlessly integrated into the page. This further promotes the online booking process and makes it easy for travelers to check availability from any page of the site! A photo-driven layout highlights the range of convenient amenities guests can enjoy at The Quarters at Lake George. From the lakeside sundeck to the beach to the sauna and beyond, it’s easy to see how guests can relax and unwind on-site during their entire stay! Whether you’re visiting Lake George for a weekend, a week, or an entire season, there are more than enough ways to stay busy and entertained! Prospective guests can learn more about the region, area attractions, events, shopping centers and outlets, and other nearby activities through an information-rich, photo-optimized Vacation Planner on the Quarters’ website.